WOW! Tell me you guys were watching that! Roy Halladay of the Philadelphia Phillies has just pitched a no hitter in the first game of the NLDS. That's only the second time this has ever happened, the last being the New York Yankees' Don Larsen in the 1956 World Series. In honor of this great accomplishment, todays fitted will be the fitted of the Philadelphia Phillies. The franchise which was founded in 1883 as the Philadelphia Quakers are one of the longest tenured members of Major League Baseball. The Quakers soon became the Phillies and wasted no time constructing a strong and proud history. They have won 10 National League Eastern Division Titles, 7 National League Pennants, and 2 World Championship Titles. The Phillies currently play in Citizens Bank Park, a 43,647 seat stadium in Philadelphia which has been open since the 2004 stadium. Some former Phillie greats are Richie Ashburn, Mike Schmidt, Steve Carlton, Robin Roberts, and Jim Thome who will surely be inducted into the hall of fame after his career. The cap above has a red crown, red brim, and a cursive capital P to represent Philadelphia. 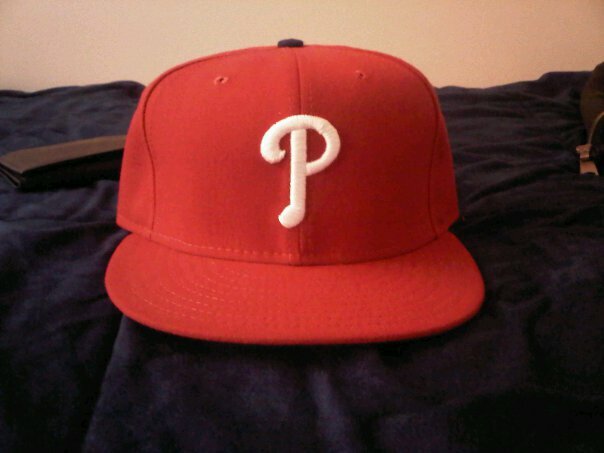 This is a clean and classic fitted that I love which I picked up on my trip to Philly for a game earlier this season.